Here are some beers I got a month or so ago. Paracelsus is awesome, haven’t tried the other ones yet. Anyone who has who would care to weigh in on where I should start? 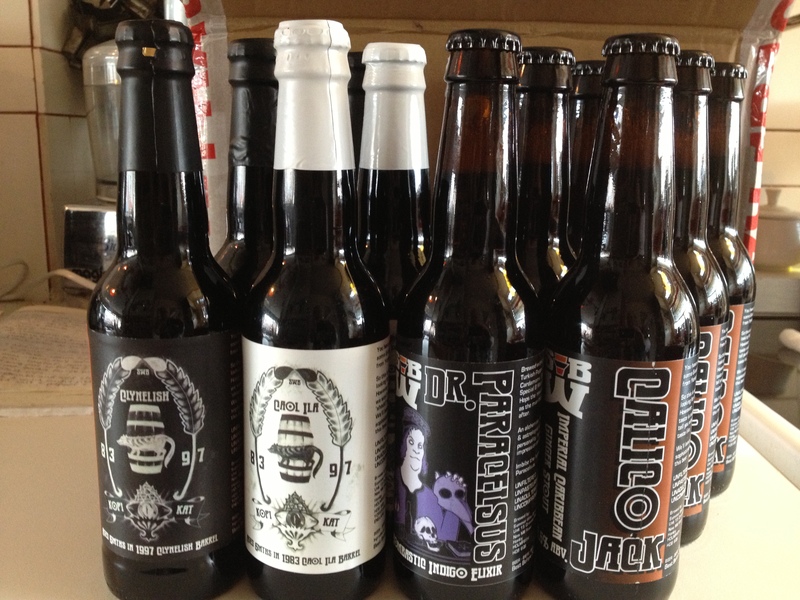 Posted on October 27, 2012, in Feature and tagged Calico Jack, Dr Paracelsus, KopiKat Caol Isla Barrel Aged, KopiKat Clynelish Barrel Aged, Summer Wine Brewery. Bookmark the permalink. 4 Comments. Ouff! Dr. Paracelsus is a tough one. Had it at Stockholm Beer & Whisky Festival. First I thought it was pretty interesting and actually quite drinkable, but in the end it was a pretty tough one to swallow. Probably just not my type of beer. I normally don’t like ginger beers and such either. Well if you don’t like spicy beers, it’s certainly not for you! I do, so I liked it – in particular I liked how well balanced the spices were, not something you often encounter with spiced beers.